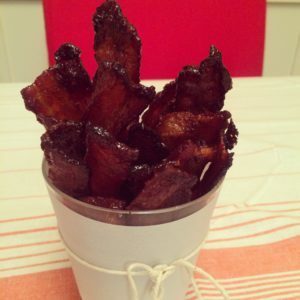 have been making this Candied Bacon for years. It still wows a crowd. 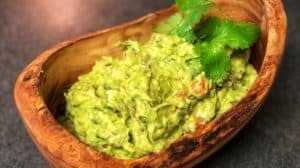 This is more of a “how to” than a recipe. I have tried several techniques over the years and think I have finally perfected it. It will take no time to prep, but the baking and cooling process is time consuming and is a must to ensure the bacon will turn out just perfect! I promise if you follow my process, the bacon will turn out crispy and crunchy every single time. It’s best to make this ahead of time, so you can give the bacon time to dry…the longer the better. Feel free to mix things up a bit…this is my basic recipe…you add cayenne if you like heat…coarse ground pepper is also a nice touch and I’m sure red pepper flakes would bring a nice little kick. I have seen a lot of recipes out there that include maple syrup. Heat oven to 350 degrees. In a bowl, combine the light brown sugar and chili powder in a ratio of 4:1. So, if you are using 2 cups light brown sugar, use 1/2 cup of chili powder. Cut the bacon so that you get two pieces per slice. I usually just cut the entire slab in half. 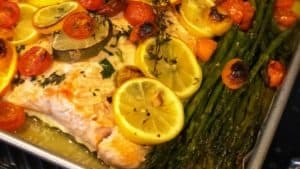 Line a baking sheet with the non-stick foil (non-stick side up). Place the bacon on the baking sheet. Do not overlap. Sprinkle each piece of bacon generously with the sugar mixture. You will more than likely have to mix up another batch. Place bacon in oven. Here is the most difficult part of this process…you want to keep a constant eye on the bacon while it is baking. After about 6 minutes, turn the bacon over and sprinkle more of the sugar mixture on top. I at least turn it one or more additional times during the baking process. Bacon will be done when it turns a golden brown and is fully-cooked. You have to watch it very carefully at the end, as the sugar caramelizes, it can burn easily…allow for at least 15 to 18 minutes in the oven. Prepare a cooling rack by spraying it with the non-stick spray. As you remove the bacon from the oven place on the rack to cool. I also continuously turn the bacon while it is on the rack so that any remaining grease will not collect in the bacon. I place parchment paper underneath the cooling rack to catch the drippings. If you are making multiple batches, be prepared to use extra cooling racks. After the bacon is slightly cool, I gently pat with a paper towel to remove any additional grease. Always place a fresh piece of foil on the baking pan for each batch. Bacon should be allowed to cool on the racks for at least two hours. 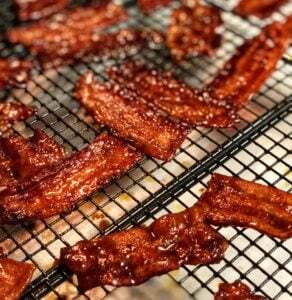 You will notice that the bacon will become harder, like candy, as it dries and will lose part of the stickiness. Contact me with any questions…tag me in your photos…ENJOY! Can’t get enough of bacon? 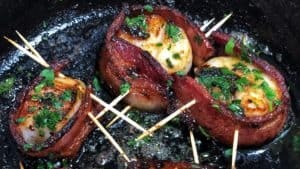 Check out my recipe for Bacon Wrapped Scallops!